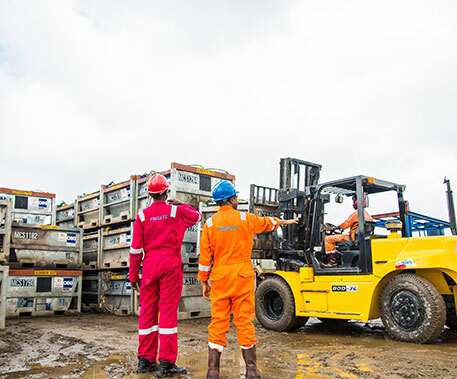 Since inception in 1999, Frigate Upstream & Energy Services Limited has been at the forefront of efficient drilling and environmental Waste Management activities for the major Oil & Gas companies. Central to our business are our modernized Low Temperature Thermal Desorption Units, (LTTDU). The Low Temperature Thermal Desorption Unit is ideal for effective processing of oil based drill cuttings, oil sludge, tank bottoms, refinery wastes, contaminated filter cakes and other contaminated materials and wastes through a distillation process and recovery of any hydrocarbon content, which will evaporate at a temperature below 340 degree Celsius. The plant is capable of extracting over 99.5% of base oil from drilling wastes leaving the treated waste cuttings with a total residue not exceeding 0.5% oil content. The Low Temperature Thermal Desorption Unit has a feeding rate of 10-15tons per hour. The Low Temperature Thermal Desorption Unit is an effective process of remediating wastes. It also incorporates sound environmental practices which are consistent with the standards of the Department of Petroleum Resources (DPR), and other environmental regulatory agencies. Is to sustainably deliver customer care through innovation. Result Oriented – We are focused on performance to achieve our overall purpose. Innovation – We consistently develop revolutionary ideas to continuously improve our various ways of creating business values. Learning – We continuously acquire new, or modify existing, knowledge behaviors and skills. Customer Focus – We are oriented towards serving our customer’s needs and creating value. Quality – We ensure strict and consistent commitment to standards in order to exceed customer’s requirements. Equitable – We deal fairly and equally with all our stakeholders. Integrity – We say what we mean and mean what we say. Safety – We work towards ensuring an accident free work place at all times. Teamwork – We see the synergy in delivering activities as a group. Frigate recognizes its responsibility to be a steward of the environment. All levels of our organization will work towards the goal of zero foot point with all of our projects. We will partner with other stewards from the areas in which we are working to design processes to identify and reduce actual or potential risks to the environment, such as the cause of fires, spills and other damage that might result environmental damage. Head Office: Plot 42 Alfa Close, Off Abacha Road, GRA Phase 3, Port Harcourt, Rivers State. Operational Base: Aker Base, Rumuolumeni Industrial Area 2 , Port-Harcourt, Rivers State.